Even a dusting of snow can be dangerous, as winter is on its way, it is important to remember the steps that you can take to avoid life-threatening accidents. While in light snow, many drivers won’t practice additional safety measures, this could put you at risk for an increased accident. 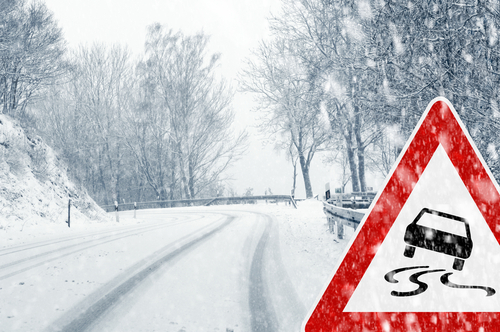 Even if you are only getting a coating of a couple of inches of snow, taking appropriate safety precautions can decrease your chances of life-changing injuries. but if an accident has already occurred, finding legal counsel right away is crucial. Maintaining your distance: because it can take up to ten times as long to stop your car in snowy road conditions than on dry pavement. Taking your time: Slow speeds that allow you to adjust for weather conditions and can help to prevent accidents. Be aware of what surfaces freeze first: and never get a false sense of security when you are out on the road because it seems like the snowfall isn’t that bad. Different structures and materials on the road will freeze faster than others, meaning that you could be facing an increased risk of an accident based simply on where you are at on your commute. Maintain visibility: Even in light snow, drive with your lights on so that other drivers can see you more easily. Visibility decreases when snow is blowing, so taking these extra steps to avoid an accident can make a big difference in your ability to stay safe on the road. Be aware of black ice: Many people make assumptions about the weather based on what they can see from the windows of their car. However, this can lure you into a false sense of security. Be aware that invisible ice, which may also be referred to as black ice, will easily blend into parking lots and asphalt roads and can be more hazardous because people are less likely to slow down for it. Taking the necessary steps to protect yourself can be extremely beneficial anytime there are adverse weather conditions which should prompt you to increase your levels of caution even more than usual, so as to avoid serious injuries. Have you or a loved one been the victim of a car accident? Do you need help pursuing a personal injury claim with the help of the experienced lawyers at Team Law? If so, please contact us at 800-832-6529 or via our online contact form to get started today.